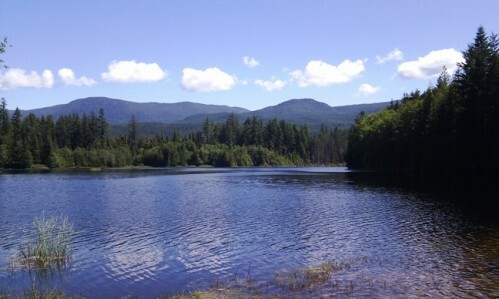 McNeill Lake is a beautiful spot to hike or bike in the Middlepoint area of the Sunshine Coast. This route circles the lake, but if you don't take a little detour, you will never actually see it. However, you will follow McNeill Creek for a short distance along the way. This is a fairly easy route in terms of hill. As a matter of fact this area is somewhat less hilly than many other areas on the Sunshine Coast. The trails are mostly easy to intermediate and will take approximately 2 hours to hike and an hour to 1.5 hours to bike. 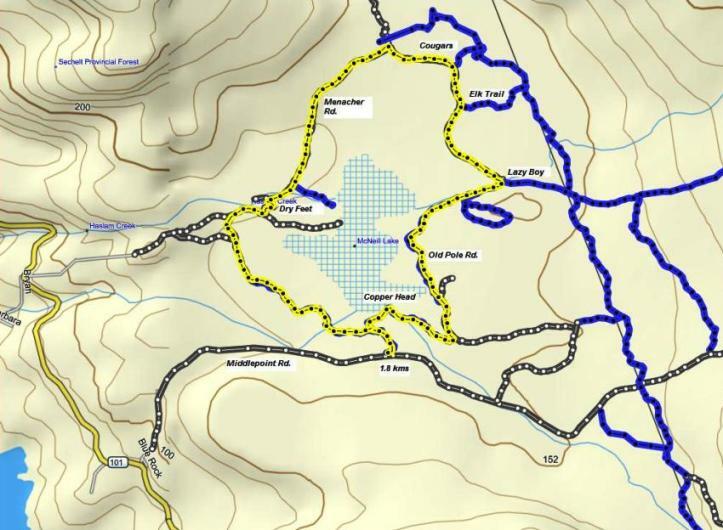 To access the McNeill Lake route, take Hwy. 101 approximately 25 kms northwest of Sechelt to Middlepoint Rd. Turn right on Middlepoint Rd. and follow the road - which quickly becomes a gravel forest service road - approximately 1.8 kms. You will see a dirt track on the left that heads into the bush. There is room for one vehicle right at the trail head or you can find a wider spot in the road just before or just past the trailhead. The image below is interactive. It is a Google Earth gadget that embeds the image of the trail route that you can zoom in and out of with the zoom bar on the right. You can also use the slider bar to back up through my route. It's pretty cool. You can close the bubble to get it out of your way. Click on the map below to open a pdf version with better resolution. Follow the trail a short distance to the the Y junction and keep to the right. This trail is called Copper Head. This trail winds through the forest and then comes out to a clear cut area and continues along the edge. You will pass by a sign that has two names Old Pole Road and Copper Head. The trail seems to split just past this sign and go left or straight. The straight portion peters out and disappears. You go to the left a short way to a logging road. Turn left again on this road and continue until you see a trail on your left called Old Pole Road. This trail skirts another clear cut area and then heads into the bush. Just before you get to another trail intersection you will see the creek that feeds into McNeill Lake on your left. This is a beautiful spot and a great spot to put your feet in the water on a hot summer day. When you come to the junction of Old Pole and Lazy Boy, turn left and cross the creek either by the bridge to the right or through it. The trail comes out to another clear cut area and is more of a logging road now. Follow along to the next intersection. You will pass the entrance to Elk Trail and Cougars. At the intersection keep to your left. You need to stay on this road for about a kilometre keeping an eye out for a trail on the left. If you want to go into McNeill Lake, take the first trail you come to. It is just a 5 minute walk in. The Dry Feet trail is just past this first trail and just before the end of the road, again on your left. This is just a short trail with a bridge to get you across the creek - thus the name Dry Feet. When you come out to the road, if you go left you can go down to McNeill Lake again or to stay on route, turn right and up past the gate. Past the gate you come to a Y intersection. The main road goes off on the right, you need to stay to the left. There are several smaller roads off to the right and left, but you stay on the main road. You'll see a sign for Copper Head trail so you'll know you're on the right track. After less than a kilometre the road heads off to the left past an old burnt out car on the left. As it heads into the bush it becomes more of a dirt path again. Follow this trail all the way back to your car. Click here to return from McNeill Lake to the Bikes & Hikes page. Click here to return from McNeill Lake route to the Sunshine Coast Trails Home page.